Is Africa ready for PrEP? One of the biggest breakthrough in HIV clinical research, since the outbreak of the epidemic 30 years ago, is the recent success in a clinical trial of a new HIV prevention approach based on the daily use of the antiretroviral drug Truvada by HIV negative person to prevent HIV transmission (Called PrEP, for Pre-Exposure Prophylaxis). The results of the iPrEX trial raised hope but also many questions and concerns as showed by the ensuing debate about what the next step should be. Divergences culminated with the Aids Health Foundation (AHF) petitioning the FDA not to consider Gilead’s request for a licence to use Truvada for the prevention of HIV infection and a joint counter response by a number of HIV advocacy organisations. 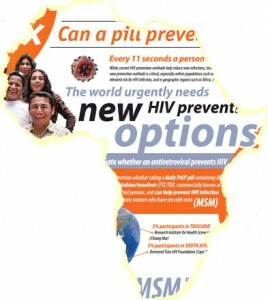 But for me as an advocate and an African living in Europe, the most important thing on my mind is “Will Africa be able to access PrEP?” Providing ARV to HIV negative people in Africa needs to be considered in light of the challenge of accessing treatment in Africa, where more than 50% of HIV positive people in the world live (UNAIDS report). Even if PrEP drugs become available, what are the mechanisms in place to ensure that it will not be tribalized in a continent where there are some indications that access to ARVs is based on political and ethnical loyalty and where there are evidences of bribery at the delivery point, misused of funds and a non-negligible ARVs black market leading to ARVs being dispensed to increasing numbers of patients at the periphery of the health system. One has to be skeptical about the PrEP implementation process in this context.